Marvel’s Daredevil season 3 is definitely coming back. And this has turned official! The American television series drama is renewed again. Its future was up in the air for a while. Check out the latest information (release date, trailer, plot, cast, villain, etc.) for the next season in the article. It is set in Marvel Cinematic Universe (MCU). Earlier, the fate of Marvel’s Man Without Any Fear was up in the air for a while. But, now everything is sorted. We are going to take the next trip to the Hell’s Kitchen soon, where Matt Murdock who is lawyer-by-the-day fights crime in the night. Charlie Cox stars as Murdock, with Deborah Ann Woll, Elden Henson, and Vincent D’Onofrio also returning from previous seasons. 2 Daredevil Season 3 Release Date: When will it come to Netflix? 3 Daredevil Season 3: Is Matt Murdock alive? 6 Daredevil Season 3 Villains: Is Bullseye Coming? 7 Daredevil Movie: Will he be a part of Marvel’s Cinematic Universe? Season 2 ended with an episode titled ‘A Cold Day in Hell’s Kitchen.’ The closer featured the following events. Let’s have a quick look at the main events. Matt Murdock made an agreement with his lady love Elektra Natchios to move from New York with each other. Daredevil defeats The Hand taking help from Frank Castle / The Punisher and his old mentor, Stick who ended the life of Nobu. Nobu killed Elektra leaving Matt devastated. Foggy Nelson accepts the job with the company of Jeri Hogarth (employer of Jessica Jones) and dissolved the unsettled Nelson and Murdock law firm. Matt Murdock disclosed his superhero alter ego to another lover Karen Page. The remaining members of The Hand escaped with Elektra’s body. The recurrence of DD is visible in the team up series “The Defenders” season 1 in which The Hand resurrected Elektra and used her as their tool. Then, she was killed again. Like Elektra, Matt suffered the same fate and was buried under the debris of the Midland Circle building. But, somehow he survives and opens his eyes with a nun by his side. Daredevil Season 3 Release Date: When will it come to Netflix? Just within four months since season 2 premiered, Marvel’s head of TV (Jeph Loeb) declared officially at San Diego Comic-con on July 22, 2016, Daredevil has been renewed for the next installment. Although the viewers were expecting to catch the brand new episodes the very next year. Ted Sarandos (Netflix’s boss) subsequently advised monition. Later, it was heard from Charlie Cox showing confirmation that he’ll come again to shoot Daredevil in late 2017, which would probably merge up with his schedule. Moreover, a fan photo was soon out after that confirming that the shooting began in New York for season 3. Jessica Jones and Luke Cage came with their second seasons in March and June 2018. So, we can expect the daredevil season 3 release date to be in the late 2018. Daredevil Season 3: Is Matt Murdock alive? Earlier, the finale of “The Defenders” appeared to confirm that Matt Murdock’s following adventures will be adapted from the much-praised popular comic-book arc, “Born Again” (1986). Matt’s prolonged missing mother’s name is Maggie. In the Born Again comic book arc, she is a nun. Therein, she cures Matt by nursing him back to health when he was fighting with death. In January 2018, it was confirmed that Wolf Hall actress Joanne Whalley will portray the said role. More casting in the arc includes Wilson Fisk. Moreover, there was a close disclosure of Daredevil’s real identity. This was a major twist portended in Daredevil’s season 2. Simultaneously, a jailed Fisk was at the point of re-examining the injury which occurred to him in a clash with Murdock that put a cut on his lip. Apparently, recalled the same harm being imposed upon him by Daredevil when he was arrested. Along with the declaration of season 3, it was followed up by a first look teaser. This seems to be an amazing news to catch up with. Therein some of the cast members show their appearance which is confirmed for the next season. We can see him patrolling the Hell’s Kitchen streets, but he doesn’t look relaxed from the inside. What are you waiting for? The official trailer still hasn’t released yet. In a later teaser, we can see the funeral of Murdock following the cliffhanger of The Defenders season 1. After a while, a set video was leaked and it showed Matt in his old black suit. Is it a flashback or has he left his Daredevil identity? Till now, there hasn’t been any hard-rock verification on the cast and characters list. However, series orderly stars – Elden Henson (Foggy Nelson), Charlie Cox (Matt Murdock / Daredevil) and Deborah Ann Woll (Karen Page) will surely return. In addition, Elodie Yung’s reborn “Elektra” is likely to feature to some extent. And Vincent D’Onofrio’s crime boss Wilson Fisk has also been confirmed to reprise his role. Speaking up the part of Kingpin, there is another disclosure that ‘Hart of Dixie’ actor Wilson Bethel will be portraying the role of an FBI agent who is laboriously engaged in the clash between Daredevil and Kingpin. In the list of daredevil season 3 cast, we also have Rosario Dawson’s helper of heroes Claire Temple. Her next appearance will be seen in “Luke Cage” Season 2. However, it could be a chance to have a reunion of her with Matt Murdock again. Seemingly, Frank Castle is less fortunate along with Jon Bernthal’s vigilante having employed Daredevil in the form of launchpad for retaining him for his Netflix series. There’s no clear statement out whether he’ll be back or not in 2018. Another finalized cast is The Foster’s Jay Ali who will join as Rahul Ray Nadeem. He is an honest but ambitious FBI agent who is willing to go extreme for his family. Daredevil Season 3 Villains: Is Bullseye Coming? Having fought The Kingpin and The Punisher, undoubtedly DD’s everlasting nemesis Bullseye is coming up while checking out the list of showrunners Doug Petrie and Marco Ramirez! Initially, came to comics in 1976 – Bullseye is actually a hitman with supernatural aim and is plausibly Matt Murdock’s greatest enemy. An image of the official crew jacket for Daredevil season 3 was leaked. It featured Bullseye’s familiar logo considerably visible. Probably, it confirms that the character is going to have a major impact on the upcoming installment. Is there a possibility of seeing the completion of Charlie’s desire? Let’s see what time shows! Daredevil Movie: Will he be a part of Marvel’s Cinematic Universe? The discussion relating to the crossover between Marvel’s large-screen attempts and their small-screen brother or sister can someday take the shape of a controversial dispute. Preceding to this year, Nate Moore (Marvel’s producer) highlighted the fact that it was seemingly feasible for Daredevil to cast a leap. That idea was absolutely creative according to him. Maybe, with no surprise, Charlie Cox is also stepping in. Moreover, in April 2016 – the actor showed confirmation that his contract deal comprises a section for Marvel’s film production. 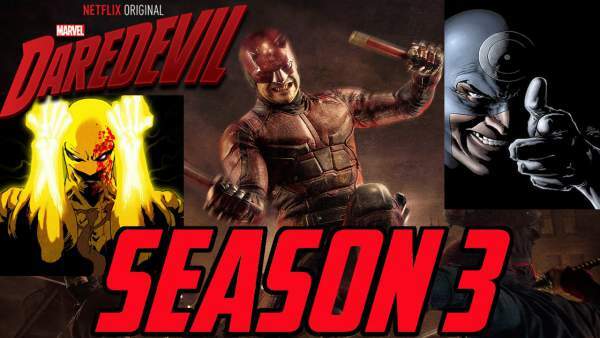 For more updates and daredevil season 3 release date and latest news, stay tuned! Previous articleGood Behavior Season 3 Release Date: Is there any renewal possible? Canceled?